The Reclining Crawford Club Chair gives you all the comfort needed for watching TV, reading or even for dozing off! 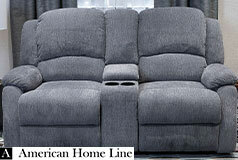 Just use the reclining latch to kick your feet up — lay all the way back or sit reclined. 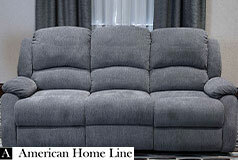 The billowing arm and back cushions are extremely supportive and ultra-comfortable. 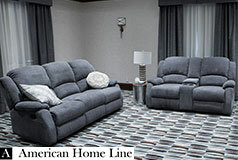 The chair is upholstered in a stain-resistant polyester chenille fabric, which is luxurious to the touch. Underneath the Crawford Reclining Chair is made from solid construction — metal reclining frame and furniture grade woods. Care Instructions: Vacuum regularly to remove dust and dirt. Use a warranty-approved fabric cleaner for removing stains and spills as they occur. Materials: The frame is made from plywood and high-performance furniture grade woods. The combination of woods provides extra durability, stability and strength. This ensures that the frame will not crack, shrink or warp overtime. Dimensions: L 36" x D 36" x H 40"
This product belongs to shipping code H.